Despite it’s phallic connotations the Unicorn has more recently come to be associated with women; specifically bi-sexual single women sought by poly-amorous couples, so called because of their apparent rarity akin to an impossible to capture mythological beast. These women are sought by poly-amorous couples for an exclusive on-going three way sexual relationship in which the ‘Unicorn’ is often expected to be compliant to the needs of the primary couple . Rather than being a part of a truly poly-amorous relationship Unicorns are often seen as subservient to those in the triad’s primary relationship. A lot of genuine poly-amorous people have reservations about Unicorn Hunters because the resulting situations can see an established couple meeting a young woman and end up using her as an experiment in poly, a sexual toy to enhance their bedroom activities and/or unpaid domestic help with little or no consideration for her emotional needs. Those in the poly-amorous community wouldn’t normally refer to themselves or one another directly as Unicorns due to it being seen as a derogatory term. 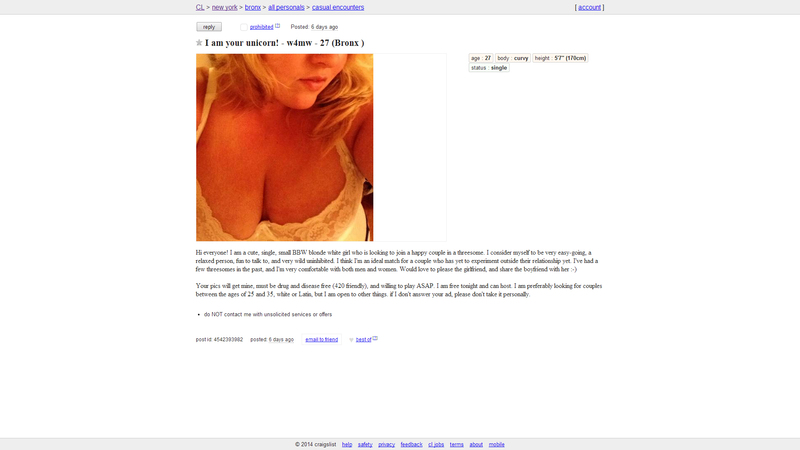 However, there are a number of dating/personals sites like Craigslist that are not specifically aimed at the poly-amorous community yet offer the opportunity for woman to advertise themselves for the attention of couples as illustrated by these images from Craigslist’s personals ad pages. A quick look at the current posts listed on Craigslist personals ads in London shows that there are 511 couples (Unicorn Hunters) looking for a bi-sexual woman (Unicorn) versus 69 bi-sexual women looking for a couple.